Amrita Sher-Gil was born in Budapest in 1913 to a Hungarian mother and a Sikh father. Her early childhood was spent mostly in Hungary, and in 1921 the family moved to India, where she began her schooling. At the age of sixteen, Amrita was admitted to the Ecole Nationale des Beaux Arts in Paris. The five years that she spent in Paris were a period of experimentation, of trying on different personae and exploring her own hybrid identity. Sometimes wearing western clothing and sometimes wearing a sari, Sher-Gil was fully aware of her ‘exotic’ beauty. Her early work often reflected the academic style in which she was trained. 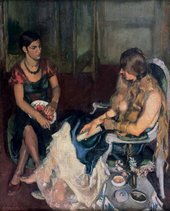 However, she also began to experiment with ways of representing the non-western body in paintings such as Sleep 1933, which depicts her younger sister Indira. 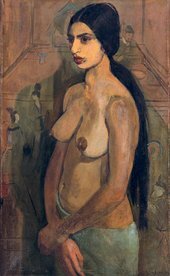 She admired Paul Gauguin’s depictions of the South Sea Islands and his stylistically simplified, yet symbolically charged Tahitian nudes. Gauguin’s influence became explicit in Self Portrait as Tahitian 1934, in which Sher-Gil appears naked to the waist, in a three-quarter profile and looking beyond the frame of the picture. Amrita’s sister Indira sits on the left clothed in chic European garb, while the partially undressed figure in the foreground is a French friend, Denise Proutaux. The two women, one poised and assured, the other more awkward with her face buried beneath streaming hair, have been as embodying different sides of the artist herself. This painting was awarded a Gold Medal at the Grand Salon in 1933. Sher-Gil encountered the paintings of Paul Gauguin during a visit to the National Gallery in London. Gauguin used expressive colour and stylised figures to represent life on Tahiti, and his work influenced Sher-Gil’s own depictions of the non-western body. In Self Portrait as Tahitian she self-consciously plays on her status as the exotic ‘other’ in metropolitan Paris. It is likely that she worked from a photograph.